I've finally got around to working on Gareth's quilt again. 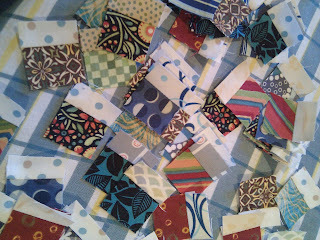 I've finished my first round of cutting strips and am on to sewing blocks together. The quilt will have about 450 blocks total, and I'm starting out with 100. Last night I got the second light strip on all of these, got them cut apart (I'm chain-piecing), pressed, and pinned to the dark strips that'll go on next. So I'm half-way through the first round. They'll have four rounds of "logs" altogether. After I finish this first round I'll take 20 of them and add the second round. Then I'll add the third round to that 20 and the second round to another 20. Apparently this is a good way to work on them so that you feel you're making progress because eventually you complete 20 blocks every time you sew a round of logs on. I'm hoping I can get an hour or so of work in every evening for the rest of the summer. I have no idea how far that'll get me, but it'll be that much closer to being done!